A variety of events have taken place in 2013 including the college’s annual Laing Lecture, this year given by Professor Jimmy Dunn and an astonishing inaugural Deo Gloria Lecture given by Heidi Baker in central London. 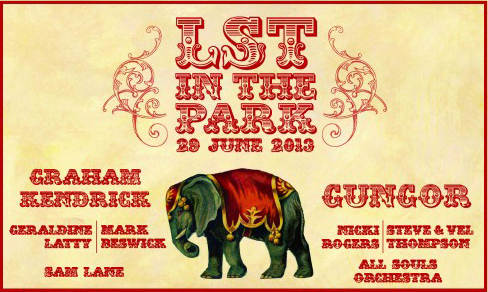 Having set an impressive tone for the celebrations, the biggest element will take place on Saturday (29 June) when LST will hold a music festival with a theological twist; LST In the Park. This is an entirely new event which promises to be a day packed to the rafters with music, food, worship and memories. Some 18 different artists are performing including: Graham Kendrick, Mark Beswick, David Bilbrough, Steve and Vel Thompson, Jamie Rodwell from Soul Survivor, Nicki Rogers, Geraldine Latty, All Souls Orchestra, Samuel Lane from Vineyard Church and headlined by Grammy Award nominated Gungor (who also appeared at this year's Big Church Day Out). There will also be student bands showcasing the new and future worship leaders who have come through the Theology, Music and Worship course at LST. These include: Oriental Experiment, The Pax Romana, Darn Funk Orchestra, Between Trees and acclaimed jazz musician / LST Alumni Dan Forshaw. The day will also feature insightful interviews with LST alumni and friends such as Lord Hastings of Scarisbrick CBE, Vice President of UNICEF UK, Krish Kandiah, Executive Director Evangelical Alliance, Dr Anna Robbins, Academic Dean Acadia Divinity College and Dr Rev Joel Edwards, International Director of the Micah Challenge. At the event the winners of the Rising Theologian Initiative and The Crossing Songs Songwriting Competition will be announced too. The day promises to be unforgettable. Located on the grounds of The London School of Theology, it is accessible via tube, train and bus as well as being within the M25. For more information and to buy tickets visit www.lst70years.co.uk or call 01923456000.